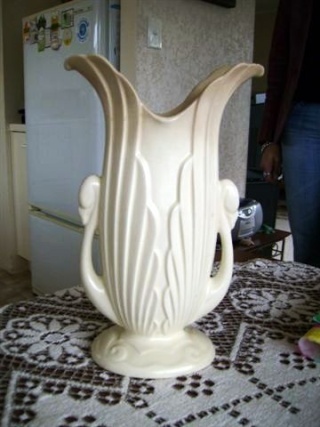 Hi all, this vase has been promised to me since I was a little girl as I loved then as much as I still do today. For the life of me I can't remember what is on the bottom of it apart from my Nana writing in permanent ink!! shock horror, I know!! I am fairly certain when I looked at it the other day it had numbers impressed very faintly. I was wondering if any of you would know who made it?? I went round to my Nanas for a cuppa this morning and had another look at my vase which Nan informs me actually used to belong to my Great Grandmother (her Ma) it has a number beneath it 1185 and a partial word impressed which is impossible to read.